Buerger’s diseae or thromboangiitis obliterans is an occlusive disease mostly located in small to medium-sized arteries and less frequently in veins. Commonly found in the upper and lower distal extremities. In prolonged cases, large extremities vessels may be affected. Buerger’s disease is generally bilateral and symmetric with focal lesions. It results in thrombus formation and segmental occlusion of the vessels and is differentiated from other vessel diseases by its microscopic appearance. Buerger’s disease occurs most often in men between 20 and 35 years of age, and it has been reported in all races and in many areas of the world. There is considerable evidence that heavy smoking or chewing of tobacco is a causative or an aggravating factor. Inflammation occurs, and the vessels are prone to spasms and constriction. Inflammatory lesions appear in healthy isolated segments of normal vessels walls, which often occlude blood flow. 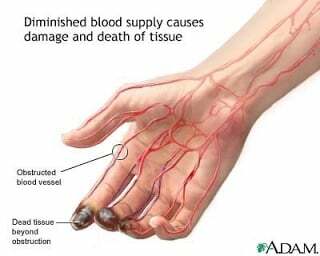 Scarring, fibrosis, and thrombophlebitis occur, which develops into adhering of the vessels and nerves. Soft tissue and skin cells experience hypoxia, which leads to anoxia and tissue necrosis. Nail beds thicken, and peripheral pulses become weak and thread. As Buerger’s disease progresses, pain occurs due to tissue death. Skin sloughs, ulcers form, and the extremity is at risk for gangrene. Intermittent claudication is a hallmark symptom, identified by cramps in the legs after exercise. Phlebography (venography) shows an unfilled segment of the vein in an otherwise completely filled vein with its connecting collaterals, this test is generally most indicative in diagnosing venous thrombosis. Ineffective peripheral tissue perfusion related to impaired circulation. Pain related to diminished oxygen flow to the affected extremity. Fear and anxiety related to actual or potential serious complications. Main objectives are to improve circulation to the extremities, prevent the progression of the disease, and protect the extremities from trauma and infection. Completely stopping use of tobacco. Regional sympathetic block or ganglionectomy produces vasodilation and increases blood ﬂow. Conservative debridement of necrotic tissue is used in treatment of ulceration and gangrene. If gangrene of a toe develops, usually a below-knee amputation, or occasionally an above-knee amputation, is necessary. Indications for amputation are worsening gangrene (especially if moist), severe rest pain, or severe sepsis. Vasodilators are rarely prescribed (cause dilation of healthy vessels only). Lie flat on a bed with both legs elevated above the level of the heart for two to three minutes. Then exercise the feet and toes by moving them up, down, inward, then outward. Lastly, return to the first position and hold for five minutes. Remove dead or damaged material from the wound, using wet-to-dry dressing with saline solution and coarse-mesh gauze filled with cotton. Use whirlpool therapy to debride the ulcer bed. Consider using an enzymatic debrider to aid removal of debris. Provide additional intervention to promote venous return and healing, maximize comfort and provide client education for measures to prevent venous stasis ulcer. Administer medications which may include antibiotics. The patient is encouraged to make the lifestyle changes necessitated by the onset of a chronic disease, including pain management and modifications in diet, activity, and hygiene (skin care). The nurse assists the patient in developing and implementing a plan to stop using tobacco. Acute Pain / Chronic Pain related to vasospasm / reperfusion disorders, ischemic / tissue damage. Pain is reduced and tissue damage is not widespread. Record the characteristics of pain and paresthesias. Rationale: Knowing the pain level. Check the patient’s vital signs. Rationale: To monitor the general state of the client. Discuss with the patient, how and why the pain inflicted. Rationale: That patients understand how to process pain. Help the patient identify trigger factor or situation example: smoking, exposure to cold and how to handle. Rationale: That patients understand the factors that influence pain. Encourage the use of stress management techniques, entertainment activities. Rationale: Used to divert the attention of the client. Soak the affected area in warm water. Rationale: Warm water will make the blood vessels will dilate and blood flow. Give the room a warm, draft-free air, for example ventilation, air-conditioning, keep doors closed as indicated. Rationale: Avoid infection and keep the air hot. Monitor drug effects and action. Rationale: Determine the level of effectiveness of the drug. Collaboration: the medications as indicated, prepare surgical intervention when necessary. Rationale: Administration of drugs to relieve pain. Observation of skin color on the sick. Rationale: To see cyanosis or redness of the skin. Note the decrease in pulse. Rationale: Identify the severity of the cessation of arterial blood flow. Evaluation of pain sensation parts, for example: sharp / shallow, hot / cold. Rationale: Knowing levels, flavors, and forms of pain. View and examine the skin for ulceration, lesions, gangrene area. Rationale: Seeing how big a part that had gangrene. Recommended for proper nutrition and vitamins. Rationale:Proper nutrition and vitamin requirements are complete will increase the body’s immune system. Collaboration: the medications as indicated (vasodilator), example: drainage lesions for culture or sensitivity. Rationale: Giving obta vasodilator make the arteries dilate and blood flow. 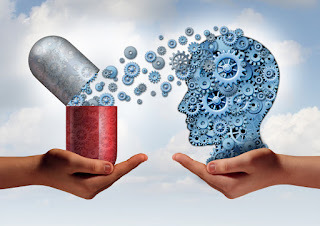 Knowledge Deficit: the need to learn about the condition, treatment needs related to lack of knowledge / resources are not familiar with, wrong perception / misunderstood. Provide information to patients about the disease. Rationale: Increase patients’ knowledge about the disease. Encourage clients to ask questions about the disease. Rationale: Knowing the client’s level of curiosity about the disease. Instruct to avoid exposure to cold. Rationale: Cold temperatures make the constriction of the blood vessels and will aggravate the blockage of blood flow. Preserve the environment at a temperature above 20.9 C eliminate cold flow. Rationale: Hot temperature makes blood vessels to maintain a state of dilatation. Discuss the possibility of moving to a warmer climate. Rationale: Avoid the severity of which will happen. Emphasize the importance of stopping smoking, provide information on local clinics / support group. Rationale: That patients know and understand that smoking is a major contributing factor to the occurrence trombongitis. Help the patient to create a method to avoid or alter discuss stress relaxation techniques. Rationale: Distraction and relaxation techniques to make the patient more calm in responding. Emphasize the importance of viewing each day and do the right skin care. Describe the action procedure to be performed. Rationale: Increase patients’ knowledge about action procedure. Explain the importance of actions to be taken. Rationale: In order for patients to understand why the need for that action. Rationale: Knowing the general state of the client. Give comfort to the patient. Rationale: Patients will feel calm and do not worry with action procedures to be performed. Reassure the patient that the action to be performed is the best course of action. Rationale: Reduce the level of anxiety on the client. Reassure the patient that the procedure acts to be performed safely. Rationale: Reduce negative thinking about an act procedures. Collaboration with physicians for the provision of drugs. Rationale: To create a calm and reduce anxiety levels.